The “PLAY HARD – HONOR GOD” COLLECTION is the first collection in a series of many unique and original collections to come by The Spirited Athlete, Inc. From sports balls to t-shirts to window clings, focus stones and wrist bands, the slogan serves as a powerful reminder to give glory and honor to God, where the athlete got their talent in the first place and to conduct themselves in a worthy manner on and off the field. A high quality product complete with stand. We can do the “Play Hard- Honor God” logo in your choice of colors- whether it’s school, club or team colors, or just your favorite! Sports available are football, volleyball, basketball, soccer, baseball, softball, mini home plate, lacrosse, and hockey (puck). 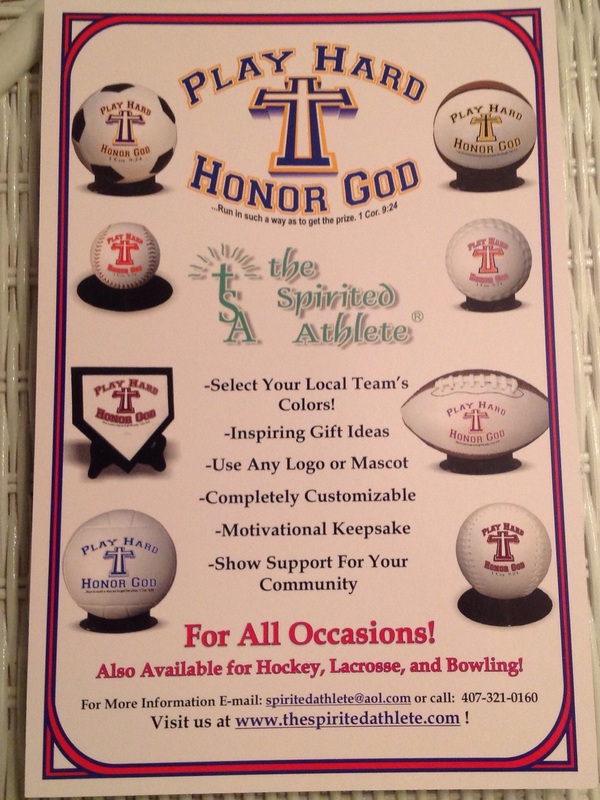 This is an awesome collectible, for your athletes, seniors, teammates, coaches, and youth ministers as well as great for gift giving and awards starting at only $25.00 each for the minis and $50.00 for the full size! Contact us at 407-321-0160 or email at spiritedathlete@aol.com to order today! Mastercard, Visa, American Express, Discover and Purchase Orders accepted. Contact us at 407-321-0160 or email spiritedathlete@aol.com to order today!